Knights are involved in a great deal of ceremony, and the Masonic order is no different. Recall the pageantry of medieval knights with our Masonic Knights Dagger. This dagger is a reproduction of a masonic ceremonial weapon and features highly ornate and complex medieval symbols on the chape and throat of the scabbard. The pommel features a knights helmet. The handle is white and features a masonic cross and other medieval imagery. 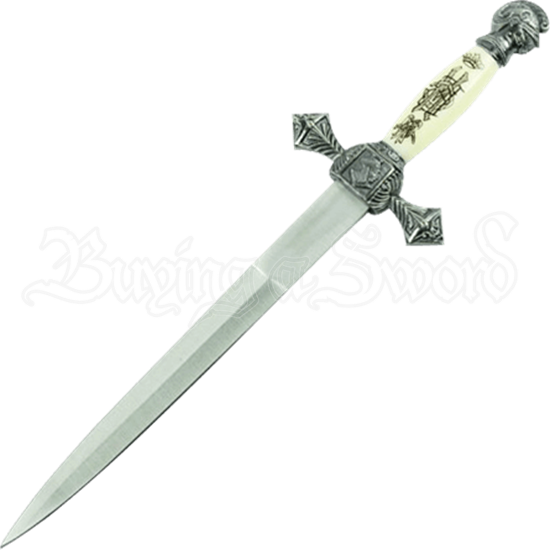 This 440 stainless steel blade is a historic reproduction of a dagger used by knights. Featured on the backside of the handle is the letter M, and the solid steel guard features a detailed image at the center. If you are looking to decorate your hip or your home with a historic weapon modeled after a ceremonial dagger, then look no further than our Masonic Knights Dagger.